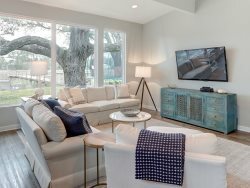 Experience the warm charm of Savannah in a unique way with Savannah vacation rentals by Southern Belle. By staying in Savannah downtown vacation homes, you can feel like you're really living in this wonderful city with all the comforts of home right at your finger tips. Hotels are a sterile experience compared to the fun of staying in Georgia vacation homes in Savannah and Southern Belle has a great selection for any type of party or stay. You won't be foregoing any hotel amenities either as all our houses offer conveniences like wireless Internet and cable TV. We have such a wide and varied selection of Savannah vacation rentals, but one of our cozier properties is the romantically-named Bird Baldwin Twelve Oaks. This house is 1,100 square feet and can sleep two guests with one bedroom and one bathroom. It would be a great choice for a couple or an individual. The bedroom provides a king size bed and the bathroom offers a shower stall with soft towels. Like all of our Savannah downtown vacation homes, Bird Baldwin offers a fully equipped kitchen and a washer and dryer in the unit, making longer stays a snap. With its convenient location between Bernard Street and West Liberty, you'll be in walking distance of attractions like Orleans Square, Savannah Coffee Roasters, Adventure Tours and Pulaski Square. Enjoy a truly great Savannah experience with these Georgia vacation homes. Inside the parlor, you'll be transported back to a nostalgic time with the furnishings and decorative touches reminiscent of a bygone age. At the same time, you'll also find modern conveniences like a flat-screen TV and a thick, plush sofa. The bedroom is in a large room just off this living area and features another flat-screen TV along with a chair and writing desk. Go through another door from there and find the modern kitchen. The kitchen is stocked and equipped to help you cook great meals during your stay. It offers a refrigerator, microwave, range, tea kettle, coffee maker, dishwasher, kitchen towels, dishes and glassware. The bathroom and laundry area are adjacent. This house also offers private parking and a back porch where you can enjoy your morning coffee or a drink in the evening. The easiest part of your Savannah vacation is finding things to do. Here's a list of 10 things to do in Savannah to get you started. 1.Visit Forsyth Park. Stroll through the 30 acres of greenery, visit the Forsyth Fountain and take a look at the three century old Candler Oak Tree. 2.Take a history tour. Savannah is known for its living history and you can explore it through a guided tour like Old Town Trolley tours or Old Savannah Tours. If you're after something spookier, try Blue Orb Savannah Ghost Tours. 3.Visit the City Market. Walk through four blocks of restaurants, boutiques, galleries and places to catch some nightlife. 4.Visit the Cathedral of St. John the Baptist. You'll find it overlooking Lafayette Square with its Gothic architecture. 5.Tour Bonaventure Cemetery. Believe it or not, but old cemeteries are big tourist attractions in Savannah. Stop by the visitor center first to get a list of famous graves and the city's prominent citizens. 6.Take a waterfront stroll on River Street. By day you can peruse the shops and eateries, by night it's a great place for pub crawls and live street musicians. 7.Take the short drive to Tybee Island and spend some time on the beach. You can also visit the Tybee Lighthouse and Museum and Tybee Marine Science Center. 8.Visit the Owens-Thomas House to get a glimpse into the past and how the upper-class lived in 19th century Savannah. 9.Stop at the Mercer Williams House Museum, which was the featured house in the "Midnight in the Garden of Good and Evil" book. 10.Browse the Telfair Museum of Art to see 4,500 pieces of art from the 19th and 20th centuries. Book your Savannah vacation rentals with Southern Belle and get amazing hotel amenities along with great locations and the comfort of staying in a real house. Our Savannah downtown vacation homes are always impeccably cleaned and decorated with a real designer touch. Don't waste your time looking at other Georgia vacation homes, but instead call Southern Belle and find out what makes us the best in the city. Excellent communication by app and email. Timeous reminders. We loved the beautiful apartment. Very clean and well set out. Quality furnishings and linens. Location was perfect for access to historic district. Off street parking was a blessing. Everyone at Southern Belle Vacation Rentals is very knowledgeable, professional, and helpful. This is our fourth time to rent thru Southern Belle Vacation Rentals. We loved staying at Bird Baldwin Twelve Oaks rental property. The location is perfect with easy walking distance to everything in the Historic District, with a parking spot a big plus. The unit was very comfortable and had all the amenities needed to make our stay comfortable and enjoyable. We would definitely stay here again and highly recommend using Southern Belle Vacation Rentals for a stay in Savannah. We absolutely loved this property and the space, very clean with lots of amenities that made the space feel like home (Apple TV, kitchen appliances, bathroom amenities, etc). If we're ever traveling to Savannah/ Georgia again, we would definitely look to rent with Southern Belle again. Very friendly when I spoke to them on the phone and eager to help. The Property was everything we could ask for. We were able to walk to most places which was great. We felt right at home and if we ever come back to Savannah, we will for sure use southern belle! We love this property! It was so clean and loved the furnishings and the decor. The location is awesome and love the parking place! We will definitely stay at this property again! We highly recommend staying here. It was beautiful in a superb location. Details were stellar I loved being able to sit and watch the rain and life happen from the large parlor windows. I did this during my breaks from being out on the town. 9. Loved my little apartment for the weekend, it was perfect. Thank you. Everyone was very friendly and accommodating. The booking process was a breeze, and I appreciated the call after our first night to check in and see if we needed anything. The property was beautifully furnished and centrally located. We could walk to everything and didn't use our car at all once we arrived.